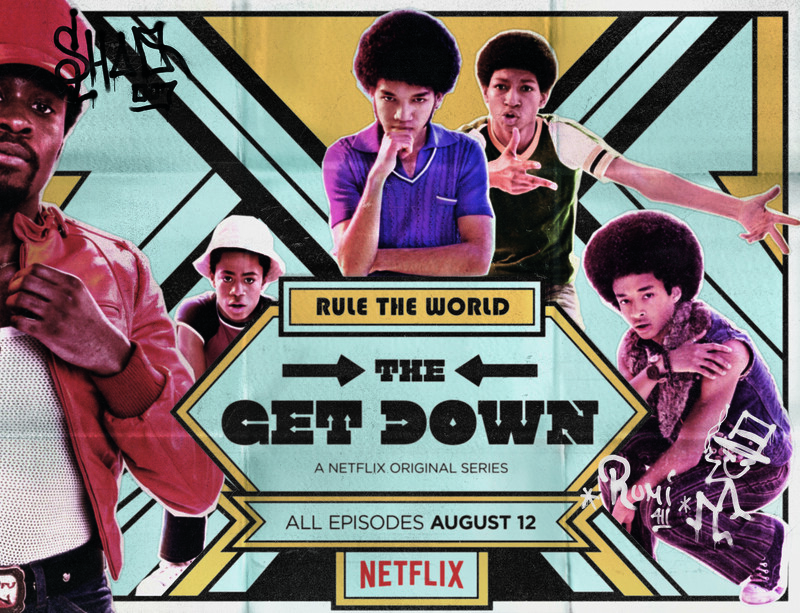 Set in the Bronx during the late 1970s, “The Get Down” witnesses the birth of hip-hop in what Luhrmann calls “a sprawling epic.” Filled with conflict, angst, raw pain, anger, joy and love, the six-episode Netflix show tackles what it means to be young in a time of turbulence. The cast boasts diversity, including Jaden Smith, Shameik Moore, Herizen Guardiola, Skylan Brooks, Tremaine Brown Jr., Yahya Abdul-Mteen II, and more. The series opens up with an adult Zeke, played by Daveed Diggs of “Hamilton” fame, at a sold-out show, and he flashes back to his youth (played by Justice) with voiceover narratives. In a Skype interview with Justice, who recently celebrated his 21st birthday, we discussed the pain that Zeke harbors and how that affects his life. In episode one, one of the most riveting moments is when Zeke surprises his teacher by passionately performing a poem he penned himself. It’s a poignant scene that reveals the anger and grief Zeke has accumulated on his shoulders from growing up in a tough, intolerant society. One of Justice’s biggest takeaways from his time on “The Get Down” was learning to adjust to the quick pace of filming. With each episode’s price tag of $10 million, the cast and crew wasted no time getting to work. At first, however, it was jarring. Smith also developed as a rapper — an art form integral not only to the content but also to the telling of the story as well, in the transitions and voiceovers. However, though Justice can rap, freestyling is a different story. On the first day of “rapper boot camp,” Justice worked with rapper and record producer Kurtis Blow who asked everyone to go around and spin a verse. Despite Justice’s nervousness and inexperience, he got through it with the help of the cast and Luhrmann’s team. At rap school, the cast was given a list of ’70s slang words. Smith’s two favorites include “def,” a synonym for cool when talking about music, and “dag,” a synonym for dang or damn. While Justice credits his basic music knowledge to growing up surrounded by his musically inclined family, he was still intimidated to approach “The Get Down.” In fact, the first thing he thought was that the role of Zeke was not meant for him — which made him want the job even more to take on that challenge. Luhrmann, director and screenwriter of “Romeo + Juliet” and “The Great Gatsby,” is known for his scope, ambition, and attention to detail. Justice told me he enjoyed Luhrmann’s visual aesthetic and process. “He is a visionary for a reason. He has a very specific cinematic language he puts in all of his projects. He is not only a visionary in the product, he is also a visionary in the process because the way he conceptualizes things in the scene are remarkable,” said Justice. He recalled a two-second scene in which his character had to grab a pair of disco boots from a shelf while Justice’s aunt was sleeping in the background. Luhrmann was incredibly intentional in his actions, even directing how his aunt should be sleeping — face tilted over, mouth open, indulged in REM, etc. The attention to detail and the beauty of the set — gritty New York, graffitied walls, red-and-white checker tiles, rubble — certainly helped the actors get into the mindset of their characters. The transformation is almost immediate with putting on the costume. Once Justice steps out of the costume, he’s back to being himself. He talked about the importance of having that distinction between his life and his character. As Justice transforms into Zeke everyday on set, he’s also transforming into a bigger and bigger star. But after emerging from his hideout, Justice met kind fans who appreciated the show and the importance of the story. And indeed “The Get Down” is looking at massive critical acclaim and positive feedback from audiences — a hopeful sign that there will be a season 2. The parallels between the conflict in the storyline and the conflict of today are undeniable. “The Get Down” is a crucial story that needs to be told. Meet the youth of America in “The Get Down” on Netflix.